The SEL Virtual Curtain Gas Migration System is the ideal solution to intercept, treat and control lateral migrating ground gas. 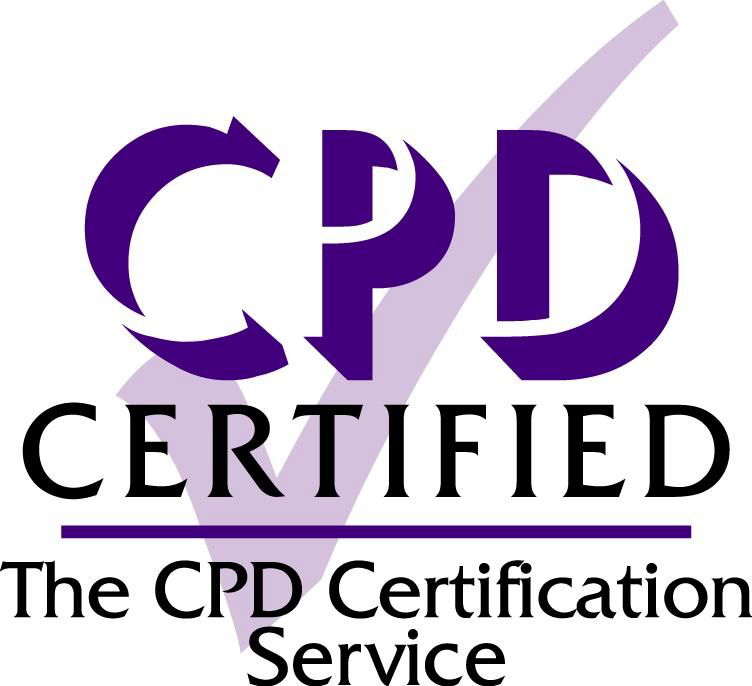 The system has been used on numerous commercial and residential projects where ground gas within or adjacent to the development posed an issue. 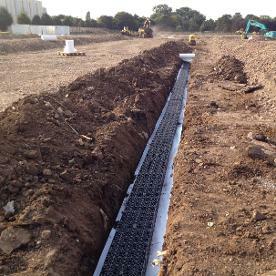 The system has been successfully installed on many development sites over the last 20 years and is a realistic alternative to a physical gas barrier and gravel vent trench. This unique patented system comprises a series of vertical vent nodes connected together to create a zone of low pressure within the ground that attracts and dilutes ground gases to acceptable levels, provide an appropriate pathway break and conduit for controlled and safe passive venting to atmosphere. The virtual curtain system can form a fundamental part of any remediation strategy to satisfy the requirements of Part 2A of the Environmental Protection Act (1990) determination and enable developments on contaminated land (closed landfill sites) or near it. Minimal exposure to contamination (e.g. asbestos) for workforce and public. Gas dispersal is controlled and diluted with fresh air prior to dispersal. Reduced risk from less vehicle movements and lower plant requirement. Shallow excavations, less than 0.65m deep. Minimal open trench required as the installation progresses. Small working zone made fully secure at the end of each shift. Robust, vandal resistant dedicated vent terminations, designed for a school environmental. Low mobilisation / start-up costs. Rapid installation will enhance site programme. Negates the off-site disposal of contaminated material. Minimises importation of granular materials. Low maintenance requirements post installation. Minimal site disruption of other trades. 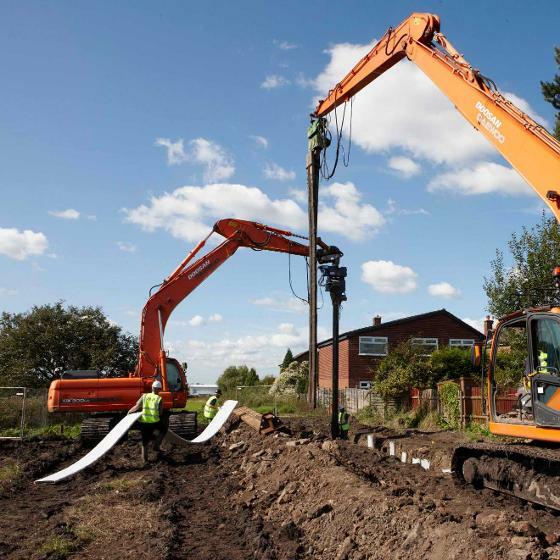 Can be installed while other earthwork operations take place, such as ground improvements. Predominantly a no-dig solution with a minimal generation of excavated material that is generally from the upper inert capping layer. 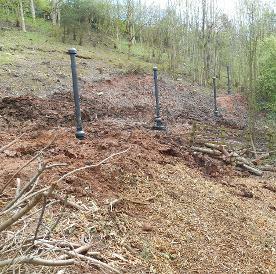 Contaminated ground remains in place. 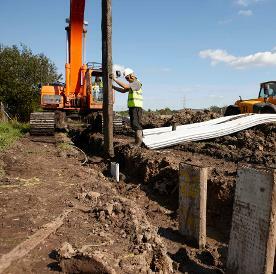 Any arisings are used to backfill over the top duct with any surplus arisings regraded to suit original ground levels. No impact on site hydrogeology. No impact on existing foundations. Replaces the requirement for aggregate venting media. Reduces site traffic on existing roads as the venting composites used are up to 100 times more efficient that gravel venting media. Uses recycled and recyclable materials. Reduces the environmental impact of your development as it uses recycled and recyclable materials. Reduces impact of quarrying through low reliance on aggregates. 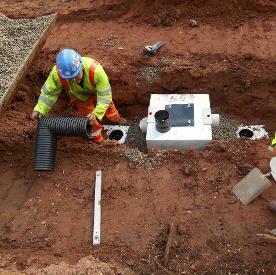 Reduces impact of tipping / landfill through no-dig installation method. Requires significantly less lorry movements than alternatives considerably reducing your carbon emissions.